A case in point being singer Addison Axe’s relocation from bustling, cosmopolitan, ‘gateway-to-Europe’ London to, err... Perth... in 2012 to join a band. Some may have viewed this as a tad loopy, but it soon became obvious that she just might be crazy like a fox, with the endeavor living up to everybody’s hopes. Axe Girl had soon released EP “Ghost Romance” which received great reviews and airplay on Triple J and independent stations. By now bassist Vanessa and drummer Brett (who have some time on their hands between Jebediah performances) were already firmly entrenched in the line-up, and soon after accomplished xbox player Warren completed the family. They were amazed to raise $10000 via Pozible in June to fund their debut album, of which Give me your Tee Shirt is the first single. 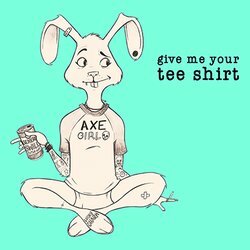 Axe Girl have popped over east twice, and are ready do so again to back up the release. Naturally Perth will be spoiled with a super-special launch extravaganza, with fairy bread, party poppers, funny hats and everything.